Fine pre-Revolution map of Paris. Nouveau Plan Routier de la Ville et Faubourg de Paris. A fine 1782 dissected pocket map of Paris issued by Esnauts and Rapilly. 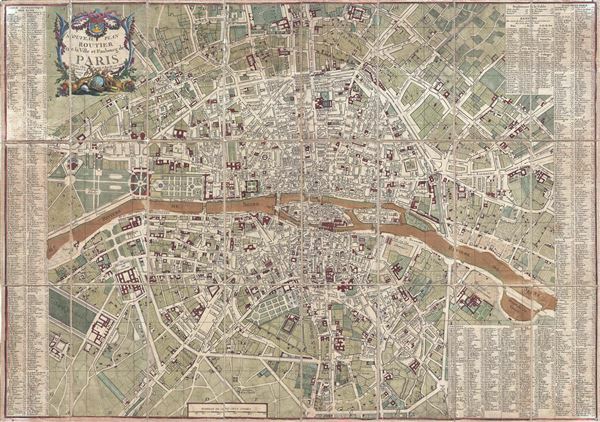 Centered on the Seine, this map depicts Pre-Revolutionary Paris. As this map was being drawn Benjamin Franklin was the toast of the town, visiting to negotiate the Treaty of Paris that formally ended the American Revolutionary War. Though Revolutionary sentiment was high among the Parisian populace, it had not yet taken on the radicalism that would soon follow. Thus street names and building names here reflect their pre-Revolutionary status rather of the more egalitarian nomenclature adopted later in the Revolution (ie. Palais Royal = Palais de l'egalite). Very good. Original linen backing worn at fold intersections, else very good. Vallee, Leon, Catalogue des plans de Paris et des cartes de l'ile de France, (Bibliotheque Nacionale), 1144.